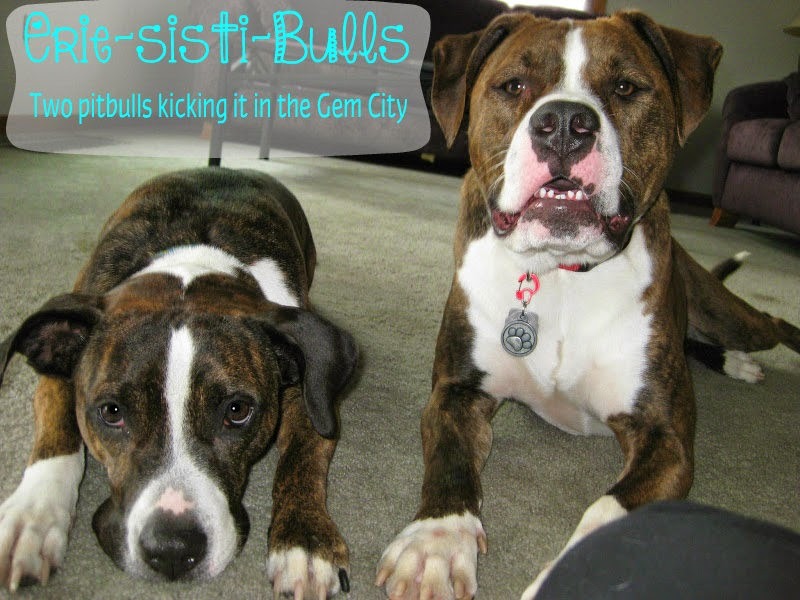 Erie-sisti-Bull: Barriers: Mental or Physical? I have freestanding gates ready to go (for the very reasons you stated, to either keep them in a room or out of one). They are all physical. Melvin & Jake are allergic to mental barriers, they laugh at them as they forge forward. We have a baby gate that we've used since Boomer was a puppy. It would be so easy for him to jump it but he has a fear of it because when he was little it fell on him when he was trying to escape. So while this is definitely a physical barrier it's also mental barrier because he taught Dottie to fear it too! When I Kaya & Norman were puppies I trained them to stay out of the bathroom because it's where the kitty litter and food was. I didn't use a physical barrier but just said "out" whenever they'd cross the threshold. The funny thing is that they translated it to all bathrooms, both at my mom's house and our new house. Though it's no longer an issue of kitty litter, I must say that I enjoy them staying out of the bathrooms! How lucky! We would love to have a barrier like that in the kitchen...we are always telling Edi to get "out." I am aunt to two pibbles and a puggle. I have a gate set up in the hall of my apartment to separate the living area from my bedroom and office. I usually keep the puggle in the office with me (with the gate closed) and leave the pibbles out in the living room until after everyone has started their morning round of power napping. Having the gate is a necessity since the puggle keeps picking fights with his pibble brother. We are a house FULL of baby gates.....It is definitely a physical barrier. We have a gate going to each spare bedroom (the cat food is in one and the litter is in another). We also have a gate to our laundry room where we feed one of the dogs (our jack Russell is food aggressive). We just recently took down one of the gates to the bedroom with the kitty litter because we were redoing the room and it was too hard to step over the gate while holding paint, a ladder, etc. The dogs did so well that we decided not to put the gate back up. This lasted for about 4 weeks and then we noticed our Jack Russell was peeing in there and our pittie discovered that cat poop is delicious. Needless to say, the gate is back up! We only have one...for the longest time we kept saying "we need another" because we were dragging it from the basement to the second floor every day. But we don't use it much in the basement anymore, though. We have baby gates to separate Turk from our fosters... and during the day to keep Rufus in our bedroom so he doesn't wander around the house. It is just tipped up against the door right now... I hope that they never figure it out though or there will be anarchy! Ugh...we hear ya! Edison has just figured it out and it is making my life miserable. Although, luckily it's only to restrict not separate.